Window handle on plate by ZB Maniglie model Space. With Graz meccanism. *Technical drawing with the dimensions of the window handle on plate available in the images. The window handle Space available in dual finishing, polished chrome and satin chrome, a elegant and modern window handle perfect environments for the next generation. 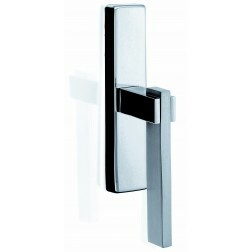 For this model are also available; interior door handle and window handle dk.